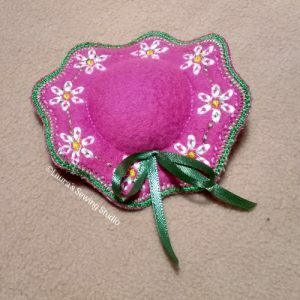 I started out making pincushions out of little hats. But as I was making them I came to realize they are pretty mug rugs and the 4×4 is a pretty coaster. If you have scraps of fleece in your stash you can make these inexpensively and use up some of those scraps. Most any fabric that does not fray will work as long as it is heavy enough. I have felted wool ready to go. These projects are great stash busters. If you prefer a mug rug then add a layer of vinyl under the back design and it will be waterproof. After the front and back sides are put together, the vinyl will not be seen. The mug rug design is made totally in the hoop. 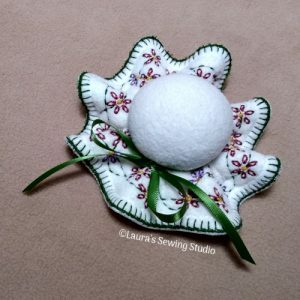 The pincushion is the same, then stuffed, gathered, hand stitch close, and tied. Being a hand embroiderer from back in my elementary school days, I created the hand look stitches – the flowers are lazy daisies. Each size design has a difference floral arrangement. These are the most obvious of the hand like stitches. 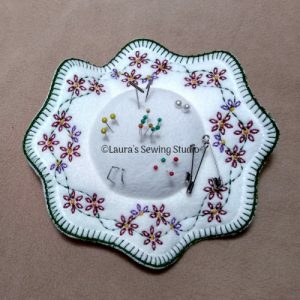 See if you can identify the others when making your pincushion or mug rug. I want my Mug Rugs! 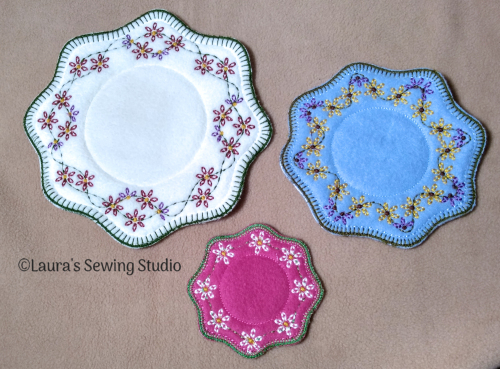 These are so lovely, perfect for afternoon tea or quilting bee. Is this a pattern to purchase? There is not patterns per se. These designs are made in the embroidery hoop. Purchase includes PDF instructions how to do this. I see you mentioned thee is no pattern. This is listed under free, but I don’t find a download anywhere. I don’t mind paying for the design, couldyou tell us where to find It? Thank you for all your lovely designs! There is no pattern per se because it is made in the hoop. PDF includes instructions for it all.